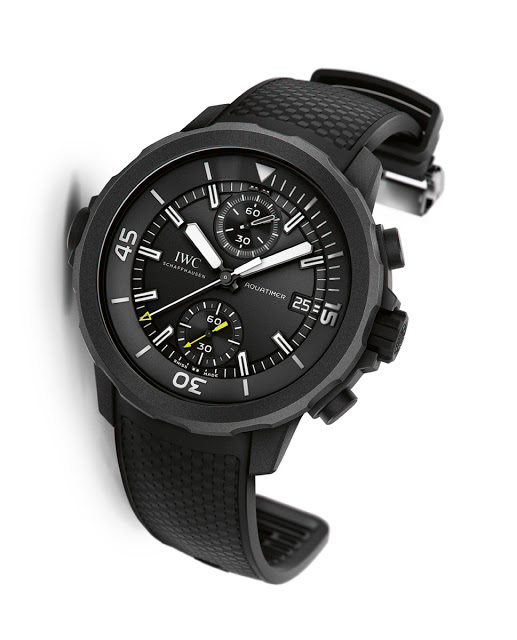 IWC has revamped its entire collection of Aquatimer dive watches for 2014. 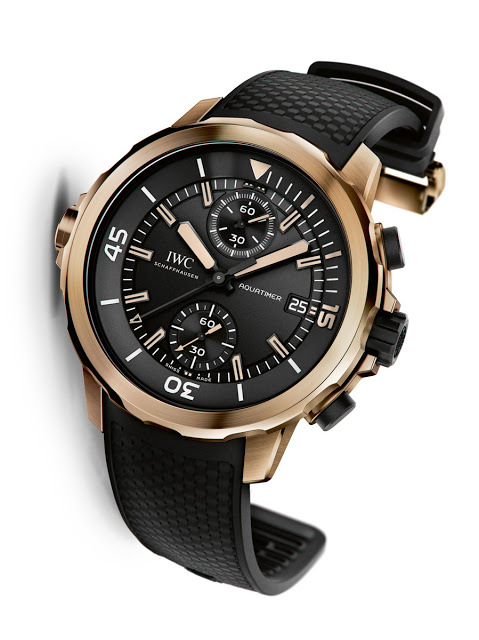 The new IWC Aquatimer is diverse, ranging from the top-of-the-line Perpetual Calendar Digital Date-Month to the bronze Charles Darwin chronograph. All models are equipped with a new internal-external dive bezel, as well as a quick-change bracelet mechanism. All the new Aquatimer watches share the IWC SafeDive bezel, a hybrid internal-external rotating bezel. Like all dive bezels, this turns only anticlockwise, moving in increments of one minute. An external, notched bezel is linked via a sliding clutch to the inner, dive bezel. Turning the external bezel turns the inner timing ring simultaneously. The bulge on the case at nine o’clock is the protective cover for the sliding clutch. 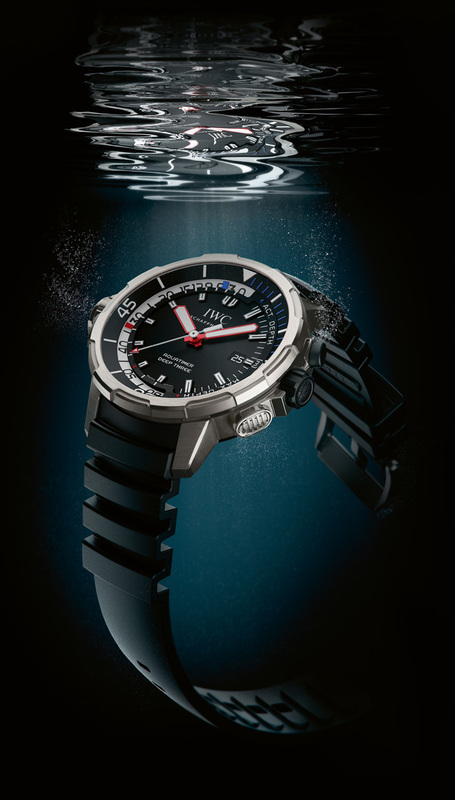 A handful of the new IWC Aquatimer range were previewed before SIHH, and here is the rest of the collection, all of which have the quick-change system where the strap or bracelet can be removed with the press of a button. At the top of the Aquatimer range sits the Aquatimer Perpetual Calendar Digital Date-Month, a 49 mm giant in rubber coated titanium with the bezel and back in red gold. Limited to 50 pieces, this uses the cal. 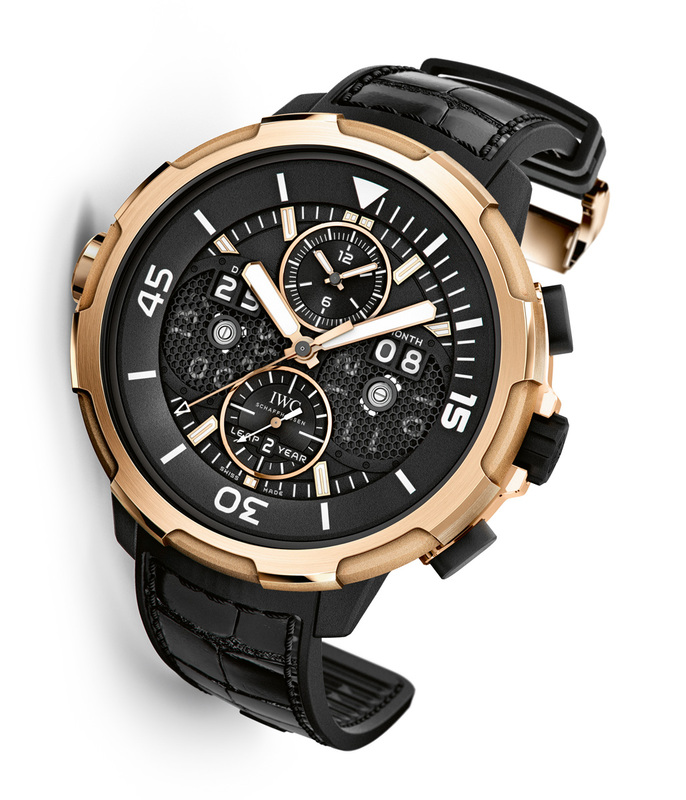 89801, which combines a chronograph with a perpetual calendar featuring oversized digital displays for the date and month. Water resistant to 100 m, its size and complication means this makes little sense as a dive watch. 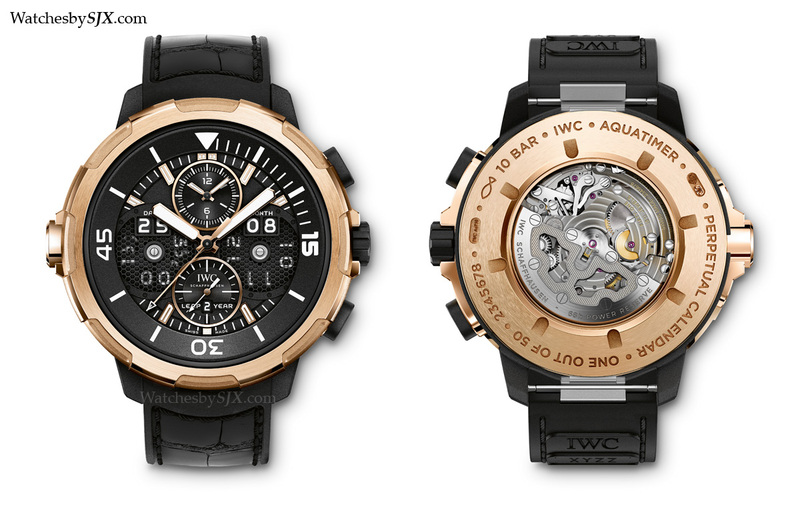 The Aquatimer Perpetual Calendar Digital Date-Month will retail for 77,400 Singapore dollars (~US$61,100). Technically more interesting and probably more useful is the Aquatimer Deep Three. 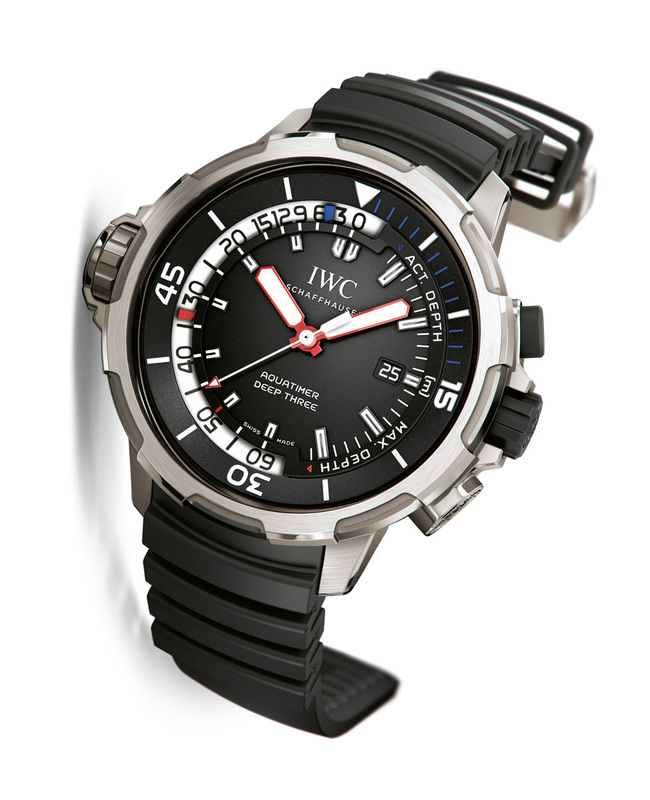 IWC makes the only reasonably successful luxury wristwatch with an integrated depth gauge (JLC tried but gave up) and the Deep Three is the third generation of this series. Housed in a crown on the left of the case, the depth gauge in the Deep Three is essentially a membrane with a pin behind it. When water pressure pushes the membrane in, the pin moves the depth gauge hands on the dial. The blue depth hand indicates the current depth, while the red hand marks the deepest point reached during a dive, both of which max out at 50 m.
The Deep Three has a 46 mm titanium case and retails for 26,300 Singapore dollars (~US$20,800). Two rubber coated Aquatimer chronographs were introduced as well. Both models have 44 mm rubber coated steel cases with the cal. 89365 inside. The first is the Aquatimer Chronograph Edition “50 Years Science for Galapagos”, a limited edition of 500 pieces with blue dial accents. This retails for 15,300 Singapore dollars (~US$12,100). 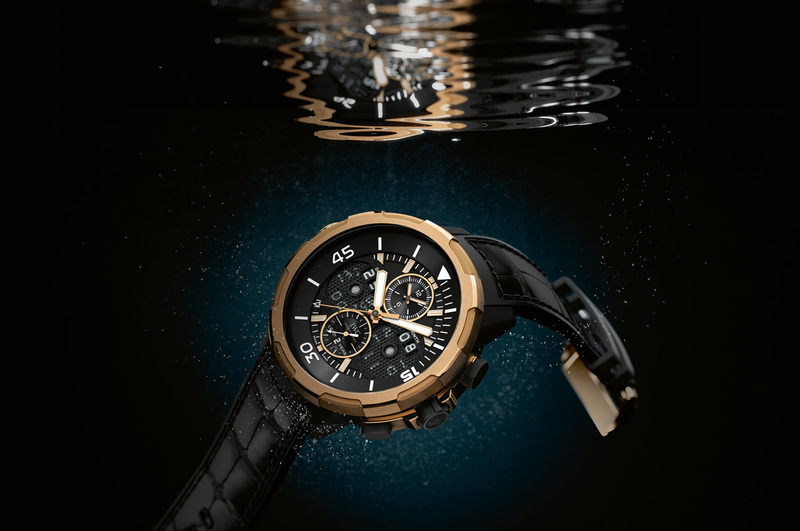 The second is the Aquatimer Chronograph Edition “Galapagos Islands”, which is part of the regular collection, and priced at 15,200 Singapore dollars (~US$12,000). 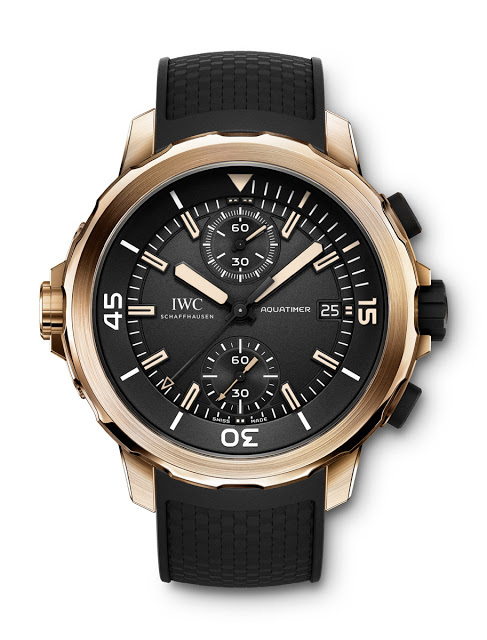 Next is the Aquatimer Charles Darwin, the first bronze watch from IWC. It has a 44 mm bronze case and is part of the regular collection, not a limited edition. The Charles Darwin will retail for 15,200 Singapore dollars (~US$12,000). 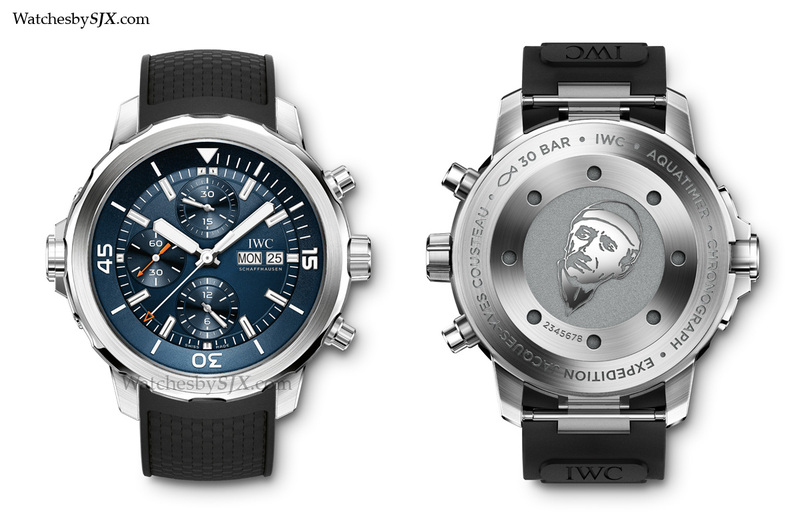 The flurry of commemorative editions continues with the Aquatimer Chronograph Edition “Expedition Jacques-Yves Cousteau”. Powered by the Valjoux 7750, this has a blue dial with orange accents, the typical colour scheme of the Cousteau series. Also part of the regular collection, this retails for 10,400 Singapore dollars (~US$8150). 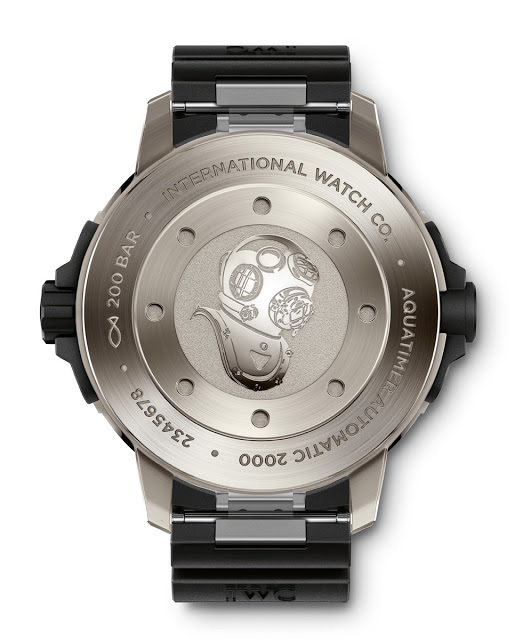 Identical to the Cousteau is the regular Aquatimer Chronograph. 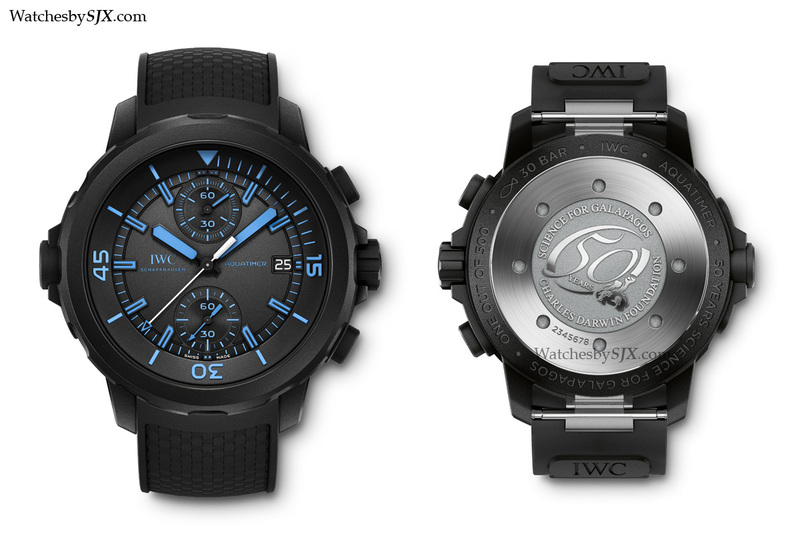 Also 44 mm and in steel, the Aquatimer Chronograph is likewise equipped with the Valjoux 7750. It’s available with either a black or silver dial, on bracelet or strap. The price is 10,100 Singapore dollars (~US$7910) for the strap version and 11,500 for the bracelet model (~US$9000). Last come the time-only dive watches. The larger of the two is the Aquatimer Automatic 2000. 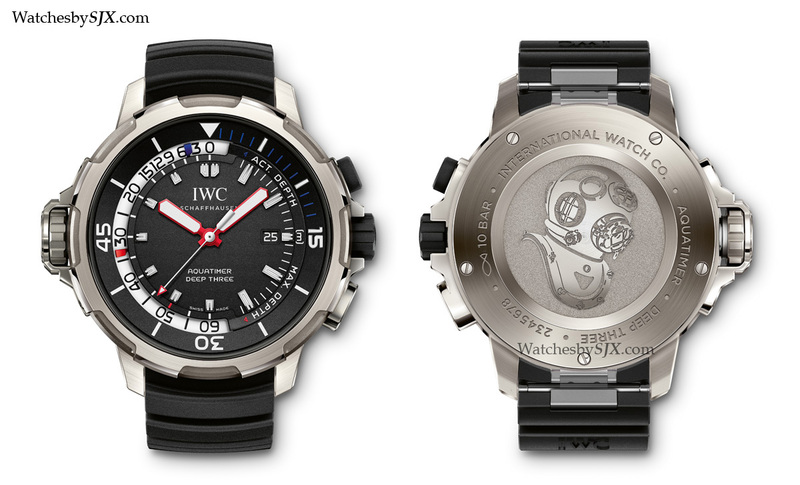 Rated to 2000 m, it has a 46 mm titanium case. Inside is the IWC cal. 80110, a manufacture movement loosely based on the Valjoux 7750. And the last of the Aquatimer line-up is the entry-level Aquatimer Automatic. The case is steel and 42 mm, with the ETA 2892 inside. It is also available in black or silver, with the option of a rubber strap or steel bracelet. This retails for 8150 Singapore dollars (~US$6440) on strap and 9550 Singapore dollars (~US$7550) with the bracelet.